After his debut appearance in a comic strip by E. C. Segar, Popeye the Sailor became a beloved star of: radio, TV, theater, movies, popular songs, and even pinball and video games. 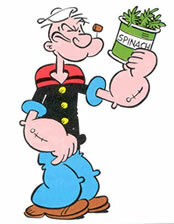 In short, Popeye was successful in every arena he could possibly appear in. This very early version of the “Popeye the Sailor Man” theme song is enough to inspire even the most squeamish of kids to try some gooey, slimy, canned green spinach for the first time.